For the final day of this year’s BFI London Film Festival, I treated myself to a John C. Reilly double-bill; the first of these was director Jacques Audiard’s Western The Sisters Brothers, a film that has received a collection of strong reviews but has unfortunately become a box office bomb, grossing just under $2 million in the US against a $38 million budget. It is the latest victim of underperforming Westerns in recent years that have sullied the genre’s once-dominant reputation, and has caused many analysts to conclude that the image of a cowboy on horseback making his way across the plain deserts of the Wild West, once an iconic hero and legend of the big screen, no longer has a place in audiences’ hearts in this era of superheroes and big-budget special effects. It is sad to see such a beloved genre become so obsolete in today’s multiplex world, but it is even sadder that not many people are actively going out to see The Sisters Brothers, which as far as Westerns go nowadays is a pretty damn solid one that is bound to delight what few fans of Westerns there are left. Set in 1851 Oregon, Eli Sisters (Reilly) and his younger brother Charlie Sisters (Joaquin Phoenix) are a couple of hitmen who are instructed by their boss, the Commodore (Rutger Hauer), to track down and kill a young chemist named Hermann Warm (Riz Ahmed), who has developed a chemical substance to unearth gold from the rivers of California. When Warm escapes with John Morris (Jake Gyllenhaal), a scout working for the Commodore who ends up sympathising with Warm’s plight, the brothers must race across the plains to find their target, getting into a few scrapes along the way and shedding a lot of blood from uncooperative forces. Though on paper it may seem that the line is drawn between who our de facto heroes and villains are, the movie actually makes it clear early on that in this scenario, there are no real villains. You get to spend a fair bit of time on both sides, with the brothers going on their journey and also with Gyllenhaal and Ahmed’s characters as they get to know each other better, and suddenly you’re not entirely sure who we’re meant to be rooting for or against here; the brothers, who began as our designated heroes, end up doing some very villainous things, and meanwhile Gyllenhaal is set up to be the antagonist but turns out to really not be through calm and approachable mannerisms. It’s not until they all come together later on that the movie reveals what our relationship to all these characters is, and the results are far from what anyone might be expecting. I really enjoyed that about this film, as it gave me something different than what I’m used to seeing in these kinds of Westerns, especially the ones made today which tend to focus a lot more on how absolutely grim and unforgivably gruesome the Old West could be. The movie doesn’t shy away from all of that, either; this is a world where anyone could succumb to fatal diseases, a clean shot to the head, spider bites, and being attacked by vicious wild animals at any given time, with not even the main characters safe from harm. Things that we take for granted today, such as warm water, flushing toilets and even the simple act of brushing your teeth, are seen as luxuries and radical new inventions that take characters by sweet surprise, especially in a time when cleanliness wasn’t regarded as a major asset for one’s personal health, and it is interesting seeing how they react to things like that whilst also approaching them with trepidation because, again, this is a world where anything could kill you without warning. Also, it makes a very strong point to show that nobody had it tougher in the Old West than the horses; there are scenes where they are set alight in a blaze, left blind in one eye following a scrape with a bear, and slowly developing a sickly disease as a direct result of that open-wound injury. It’s enough to make any horse lover have nightmares for weeks, especially when you see how harshly they can be treated by Mother Nature sometimes. But as grim and harsh a world this all takes place in, it does have a surprisingly strong heart to it, which is elevated by the great performances by both John C. Reilly and Joaquin Phoenix. They share a sweet chemistry with each other that any sibling will instantly recognise, while also shining in the ways that both actors are known to do so, with Phoenix going all out in scenes that call for him to be so intoxicated he’s barely functioning (including an inspiring moment of projectile vomiting), and Reilly as the caring and considerate one of the two who has some heartbreaking moments which he acts the hell out of, showing how versatile and incredible he is as a performer. Even though you don’t agree with some of the things they do, you’re still on board with them because they are such interesting characters who you don’t necessarily want to see succumb to the horrors of the Old West. Gyllenhaal and Ahmed, in smaller but no less significant roles, both also do some great work here, as people who could have so easily been written or portrayed as the straight-up bad guys but give them such humanity that early on you are wanting them to triumph over the guys we’re being asked to focus on. I hope the underperformance of this film doesn’t deny the film a theatrical release in the UK, because I think this could very well catch on with audiences who are looking for a slightly different Western to sink their teeth into. 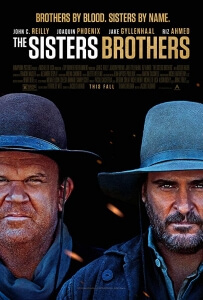 The Sisters Brothers is a unique and very entertaining Western which doesn’t ignore the harsh realities of the Old West, but has a surprisingly strong heart that’s boosted by the two great lead performances by John C. Reilly and Joaquin Phoenix who also share a believable sibling chemistry with each other.